70 • FOODSERVICE EQUIPMENT & SUPPLIES • JUNE 2018 chain profile Beyond that, the concept features a relatively simple back of the house. A hand sink next to the smoker makes it easy for staffers to wash up after loading raw pro- teins. The back of the house also includes worktables for prep, a three-compartment sink, a dish area and dry storage. A walk-in cooler/freezer combo that measures about 8 by 12 feet handles cold storage. Like the smoker, this walk-in sits flush against the restaurant's back wall, with an entryway built into the building. "Your three biggest pieces of equipment are your smoker, your cooler and your freezer. We don't like to pay rent on those. If we get a landlord that lets us put them out back and frees up space inside, that's an ideal lease opportunity for us," says Martino. Smoker to Plate A staff member removes meat from the smoker, placing the protein in a pass-through warming cabinet. The other side of this cabinet opens to the front-of-the-house cookline. This warming cabinet is the piece of Willie Jewell's equipment package that's changed the most since the first store, Martino notes. The original cabinet wasn't a pass- through unit. Instead, staffers would unload meat, place them on a cart and roll them to the front-of-the-house production line to load them in the warmer. This setup, Martino says, was inefficient and messy. The cleaner, new design requires fewer steps and doesn't disrupt the production area. Even better, it's improved food quality by guar- anteeing staff serve Willie Jewell's meats in a first in, first out basis. The hot holding cabinet is just one part of the main pro- duction area, of course. The pass-through sits along this area's back wall. Mov- ing right to left is a lowboy refrigerator-freezer, which holds premade salads along with items for the fryer. These include french fries, hushpuppies, catfish, onion rings, fried pickles and chicken tenders. 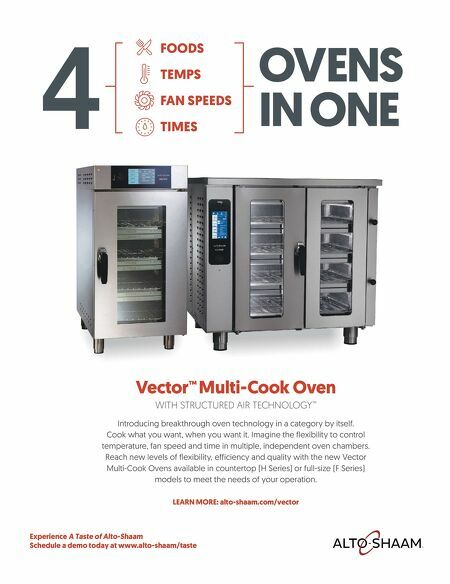 All fried items cook in just two fryers. No single unit is dedicated to one type or group of items, simply because there's no need to do so. The chain has tested and worked with its products for years and feels it doesn't have a problem with flavor transfer. Following the fryers sit a gas-fired chargrill, then a six- burner range with an oven below. Staff use the grill to make hamburgers, including one topped with pulled pork and cheddar cheese, as well as grilled chicken used for sandwich- es, salads and a dinner platter. On the range, staffers make items like Brunswick stew (a tomato, bean and vegetable dish) and use the oven to cook desserts like cobbler. While just a few pieces make up the back side of the production area, the side facing the front of the house is just as simple. Starting from the right, directly across from the warming cabinet sits the cutting station. While most of the production line is behind a wall, this station has a cutout, along with a food shield to protect the food. Willie Jewell's exposed this station, says Martino, to show customers it serves real barbecue cut to order. It's not uncommon, he adds, for guests to stand at that window and talk to this quasi pit boss about the chain's food. Again moving right to left, next comes the middle station. The staffer here serves as the production area's maestro. He or she calls out orders from the ticket printer to the meat cutter, then takes the cut meat and places it on a platter, salad or bun for a sandwich. This spot holds the restaurant's breads, includ- ing buns and garlic toast. Other than a table for holding bread, the lone piece of equipment at this station is a toaster, which was recently changed to a wall-mounted version to save space. After the middle station comes a four-pan steam table, which the chain uses to hold its sides, including mac and cheese, collard greens, sweet potatoes, green beans and more. Culinary staff usually make these sides daily, with backups in the same holding cabinet that stores the barbecued meats. After plating the meat, the order moves down to the sides table and finally staff place it on the pass-through window. 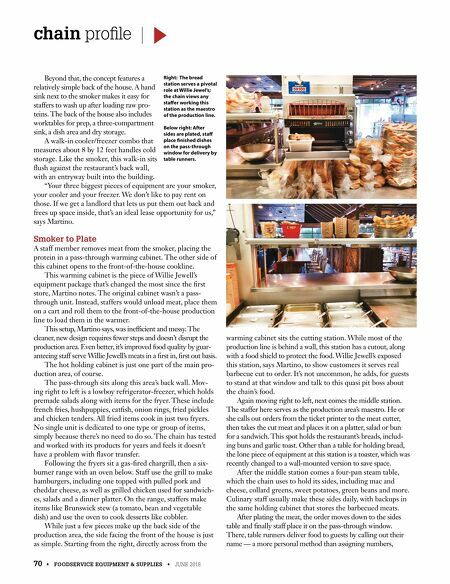 There, table runners deliver food to guests by calling out their name — a more personal method than assigning numbers, Right: The bread station serves a pivotal role at Willie Jewel's; the chain views any staffer working this station as the maestro of the production line. Below right: After sides are plated, staff place finished dishes on the pass-through window for delivery by table runners.